Who is working to put computers into the hands of low-income students? 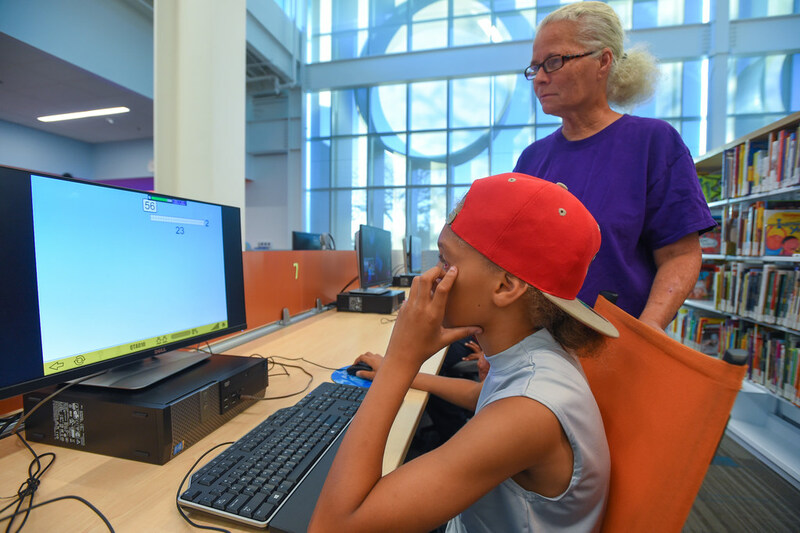 Vickie Jones and 10-year-old grandson, Quincy Taylor, are fixtures at Long Beach’s Michelle Obama Neighborhood Library. “We’re here every day after my grandson gets out of school,” Jones said. They can be found at one of several sprawling banks of computers. Jones said she has a “small laptop” at home, but can’t afford a broadband subscription. So she heads to the library so Quincy, a fourth-grader at Jane Addams Elementary School, can do his online homework. She goes online, too. “He’s supposed to be working on homework and after that I told him he can get on his games,” she said. 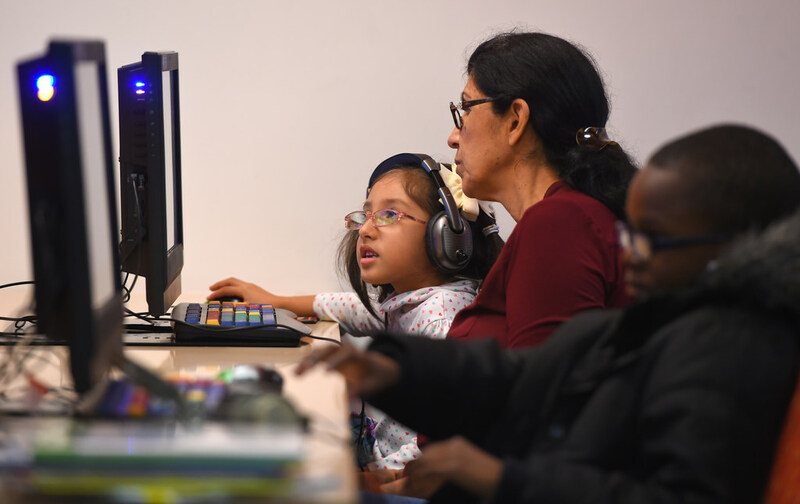 Michelle Obama and other city-run libraries play a role in putting computers in the hands of schoolchildren in an era when much homework is internet-based. 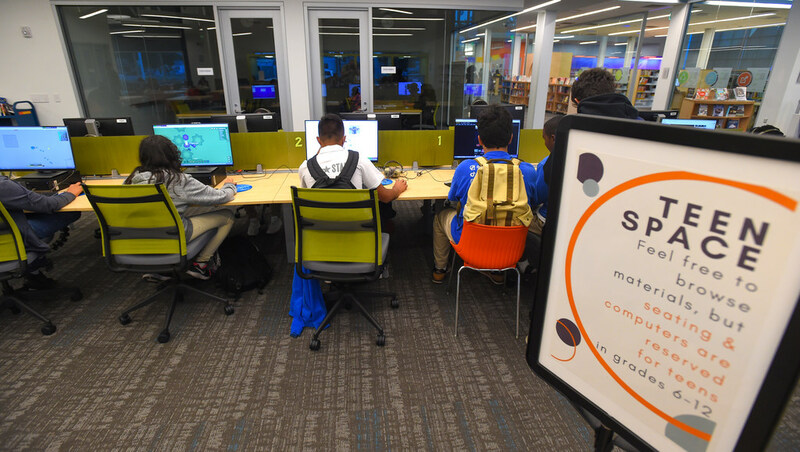 The 12-branch system is part of the answer to the top-ranked question readers have raised so far in response to the Long Beach Media Collaborative’s ongoing series on the digital divide. 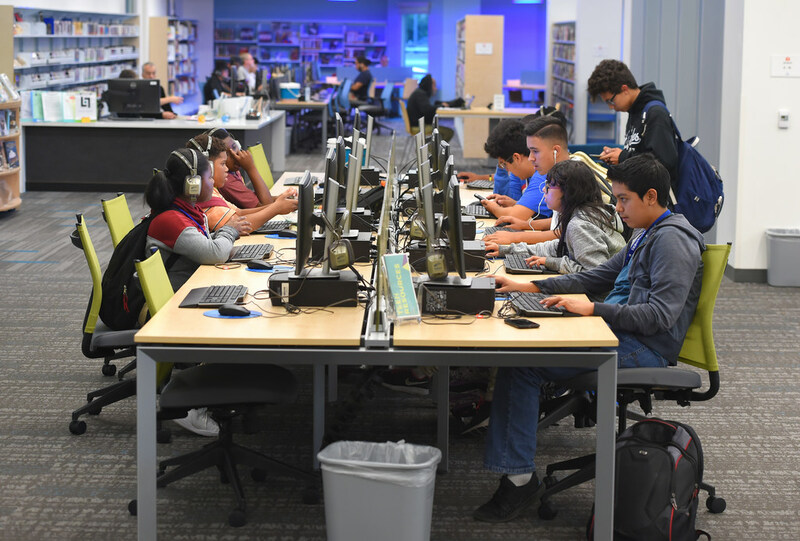 That question is this: What can we do to get computers into the hands of low-income Long Beach students so that they have the computer literacy skills they need? It’s an important question. One that experts and officials have been wrestling with throughout California and the nation. And one that eludes easy answers. Because the Long Beach Unified School District is the primary entity that educates the city’s low-income students, we put the question to Chris Eftychiou, a district spokesman. Until poverty is significantly reduced, though, it will be important for schools to take the lead in making sure students have access to computers and the internet, experts say. Ideally, said Sunne Wright McPeak, chief executive officer and president of the California Emerging Technology Fund, an advocacy group with offices in Los Angeles and San Francisco, the district serving a particular community should place a school-purchased device, with a keyboard, in the hands of each low-income student. Long Beach has made strides in that direction. Officials said the district has issued 58,000 Chromebooks and 11,000 iPads. Total district enrollment is 74,000. Vanitha Chandrasekhar, education technology coordinator for Long Beach Unified, said the district began updating school labs around 2010 so kids could practice on computers and develop keyboard skills. Since then, Wi-Fi has been piped into classrooms and the internet has been weaved into virtually every facet of educational life. “Because about 70 percent of students in our school district come from low-income households, and we have systematically integrated technology into our curriculum, we are providing opportunities for students from all walks of life to develop computer literacy,” Eftychiou said. But the schools can’t do it all. So it helps to have city libraries involved, too. Most libraries have family learning centers, where kids can get help with homework, Gerot added. 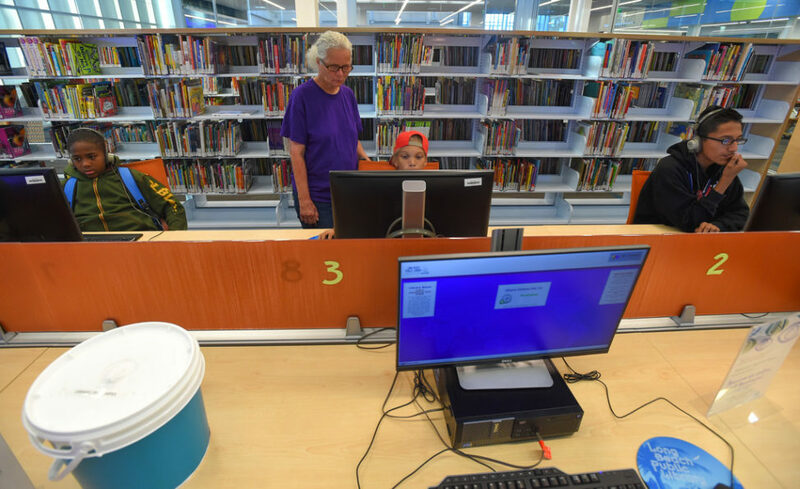 According to a list provided by the city, there are more than 260 computers at the libraries. Community groups put computers in the hands of low-income children, too. Centro C.H.A. has a technology center, for example, that has a dozen computers. The YMCA of Greater Long Beach has dozens more available for public use. Other groups such as human-I-T take donated personal computers and laptops, refurbish them and give them to low-income households for free. In short, the answer is it will take a team effort.